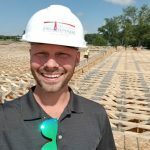 Drew Mitchell, vice president of development at Holladay Properties, is excited to see the $40 million investment in the Promenade at Founders Square in Portage begin to take shape. After five years of planning, Drew Mitchell, vice president of development at Holladay Properties, is excited to see the $40 million investment in the Promenade at Founders Square in Portage begin to take shape. The residential /retail facility will circle three sides of Founders Square Park once completed. The company purchased approximately 20 acres from the city’s Redevelopment Commission for the project. That vision includes more than 16,000 square feet of unique, niche retail shops, 500 luxury apartments designed to attract millennials and empty nesters, and amenities such as a cyber café and fitness studio. The first phase will include five buildings located north of Main Street, south of the Indiana Toll Road, east of the Little League fields and west of Hamstrom Road. This phase will also include a community room, an art studio and a facility for elderly residents who may need assistance. Apartment models, which will include everything from studios with one bath to three bedrooms with two baths, will be available to view next spring. The first phase is scheduled for completion in the summer. The second phase will add four buildings and construction will begin as soon as phase one is complete. Commercial development will include restaurants, retail, boutiques, offices, medical facilities and assorted amenities on the first floor of the five buildings, according to Mitchell. Expanding and developing the area around Founders Square has been a high priority for city officials as they work on different ways to attract various age groups to Portage. Centennial Village rendering shows one of the eventual 15 buildings on its 15 acres. Six of the buildings will be four stories high, with residential components on the top three floors. Planning Director Tom Vander Woude says the development of Centennial Village is a precedent for the evolution of the Town of Munster. Munster has placed an emphasis on developing walkable communities, a highly desired amenity for those looking to call Northwest Indiana home. Centennial Village, located on the corner of 45th Street and Calumet Avenue, will eventually contain an upscale hotel with 99 rooms and extensive amenities, a Japanese steak house called Kitaro and dozens of niche shops not found in big box malls. Groundbreaking on the first two buildings took place in late spring. Those first two buildings will house four restaurants—two each—and many attractive retail shops. Proof of that statement lies in the fact that dozens of condominiums in Centennial Village have already been sold, even though construction is ongoing. Anderson adds that Centennial Village will eventually include 15 buildings on its 15 acres. Six of the buildings will be four stories high, with residential components on the top three floors. Speaking of tracks, the town is working with regional partners to build an underpass beneath the Canadian National Rail tracks that cross Calumet Avenue. Once that project is complete, 45th Street east of Calumet Avenue will be realigned to reduce congestion at the Centennial Village site. 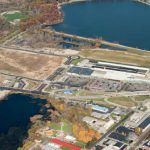 NewPorte Landing project includes the redevelopment of 50 acres along Clear Lake in the heart of La Porte. Plans are to build spec and custom retail buildings of 8,000 to 10,000 square feet in 2018. The Greater LaPorte Economic Development Corporation (GLEDC) provides prospect and project development, coordination, retention and expansion services. In that regard, they teamed with Holladay Properties to redevelop NewPorte Landing. The project includes the redevelopment of 50 acres along Clear Lake in the heart of La Porte. Twenty acres are now shovel-ready, according to Micka. The current plan is to build spec and custom retail buildings of 8,000 to 10,000 square feet in 2018. “This project has been a long time unfolding,” explains Mike Micka, vice president of development for Holladay. “We began in 2013. Some of the land includes the old Allis Chalmers factory. We had a lot of preparation to make the land reusable. Micka explains that Holladay is the master developer for the property, and they work in tandem with GLEDC on the vision. 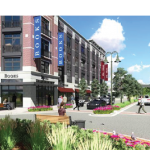 “What both sides envision is a focus on retail and mixed-use development,” says Micka. “We want this project to complement the downtown area, not steal from it. We’re focused on bringing new business to La Porte, not move everything from downtown. It’s a balancing act. A 50,000-square-foot sports complex that will focus on youth and adult volleyball will be built at NewPorte Landing, according to an August 7 town press release. The Dunes Event Center will be designed to draw teams and spectators to La Porte for tournaments. Eventually, the complex will include batting cages, basketball courts, soccer fields and event space. In addition to Holladay’s plans for the 20 shovel-ready acres, Dunkin’ Donuts opened in 2015 at the Landing, and Starbucks purchased a parcel to develop next year. Holladay is in negotiations with two larger restaurants, although Micka says it’s too early to release names. Holladay will own and lease the land and buildings. Not all of the local land development is retail and residential. In the South Bend area, Great Lakes Capital is making news with industrial growth. The real estate developer and private equity firm recently signed a lease with Communications Test Design, Inc (CTDI) for a 315,000 square-foot building. This will be the first development north of Adams Road just off I-90 in Phase II of the Portage Prairie Industrial Park. CTDI is a global engineering, repair and logistics company in the communications sector. They’ve had a location in South Bend for more than 28 years, and had outgrown their current location. Breaking ground on the 119-acre site occurred in June. The plan is for CTDI to take occupancy in February 2018. Meanwhile, Great Lakes Capital has already fielded several inquiries and begun marketing the remainder of the site. The company previously built a 210,000 square-foot spec building for the city that is now occupied by American General, builders of the Humvee. Great Lakes Capital is also developing a modern warehouse and distribution center at Ameriplex, located at I-80/90 and only five miles from the South Bend International Airport. The building will be 210,000 square feet and similar in design to the building leased by American General. Smoke says the building can be enhanced with build-to-suit options and flexible demising walls. Bob Moulesong’s writing career spans twenty years as a freelance journalist, author, blogger, and editor. His work has been published in the NWI Times newspaper as well as several subsidiary magazines. His short story White Picket Fence won a Reader’s Choice Award from the magazine Short Fiction Break in 2014. He published numerous short stories in genre anthologies, and recently published Lunacy, a collection of his original work through Pen It! Publications.